The Mountain Time Zone is one of nine standard time zones used all around the United States and territories owned by the U.S. This time zone covers the western half of the central United States. The name of the time zone comes from the fact that one of North America's largest and most well-known mountain ranges, the Rocky Mountains, is almost entirely located within this zone. The Mountain Time Zone, as well as other US time zones, was introduced in the late 19th century. The zone covers five states in their entirety, as well as applying in small to large areas of ten other states. Mountain Time is also observed in several states of Mexico, as well as some provinces and territories of Canada. The Mountain Time Zone is one of the four major time zones covering the contiguous United States. The biggest city covered by the Mountain Time Zone is Phoenix, which is the capital of Arizona. The Phoenix metropolitan area is the biggest of its kind in the Mountain Time Zone, and other major US cities in the zone include Denver, Colorado and El Paso, Texas. Time zones didn’t exist when the United States was colonized and founded. Back then, people simply used the sun’s position to tell the time and would adjust their clocks accordingly as the sun crossed the meridian over their town or city. This meant that local time would differ greatly from one part of a state to the next and caused a lot of issues. The most problematic consequences of having no time zones came when railroads were introduced all around the US. Trains need to run on schedules and timetables, but it was impossible for any proper schedules to be organized as time would be kept differently from one station to the next, meaning that passengers and commuters could never really know when a train was going to arrive in a certain place. The railroad authorities introduced their own set of 100 time zones to compensate for this problem, but issues still abounded. In order to help make everything much simpler, four major time zones were defined and introduced in 1883, on November 18 to be exact. On that day, telegraph signals were sent out to major cities all around the nation, instructing them of the precise time in their zone. The four major zones of Pacific, Mountain, Central, and Eastern were established and became the norm for the US, while other time zones were later added for additional states and territories like Alaska, Hawaii, and Samoa. 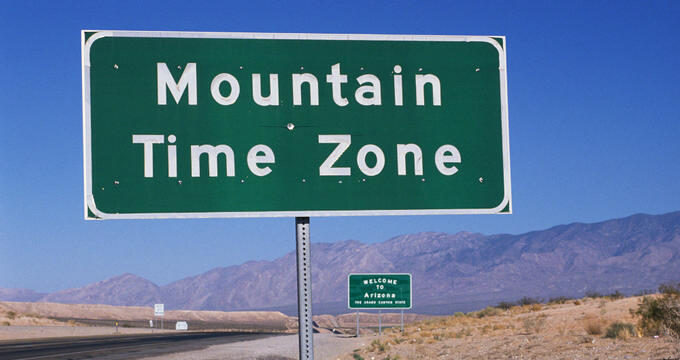 The Mountain Time Zone is known simply as MT. Mountain Standard Time (MST) is used from November through to March in the US and Canada and is seven hours behind Coordinated Universal Time (UTC). Mountain Daylight Time (MDT), meanwhile, is used throughout the rest of the year during daylight savings periods and is six hours behind UTC. The state of Arizona, however, does not use MDT. Colorado, Montana, New Mexico, Wyoming, and Utah are entirely contained within the Mountain Time Zone. Ten additional states (Arizona, Nevada, Texas, Kansas, Idaho, Oregon, Nebraska, Oklahoma, North Dakota, and South Dakota) are partially or majorly covered by the zone. In Mexico, five states and some islands are included in the Mountain Time Zone. Up in Canada, all of the Alberta province observes Mountain Time, and parts of British Columbia, Northwest Territories, Nunavut, and Saskatchewan also fit into this time zone. Daylight savings time was introduced in 1966 in time with the Uniform Time Act, designed to help save energy and allow people to enjoy more sunlight in summer evenings. The idea was first proposed by Benjamin Franklin in the 1700s and had been introduced in other countries before arriving in America. Originally, daylight savings applied from the first Sunday of April to the last Sunday in October. Since then, the Energy Policy Act of 2005 has changed the rules for daylight savings time, extending the period of daylight savings from the second Sunday of March to the first Sunday of November. Almost all areas within the Mountain Time Zone switch to MDT during this period. The state of Arizona is one of the only US states to not use this system and neither does the state of Sonora in Mexico. These areas technically therefore observe MST all year long.